Una mostra fotografica, che fa vedere una selezione di ritratti e paesaggi dal mondo. 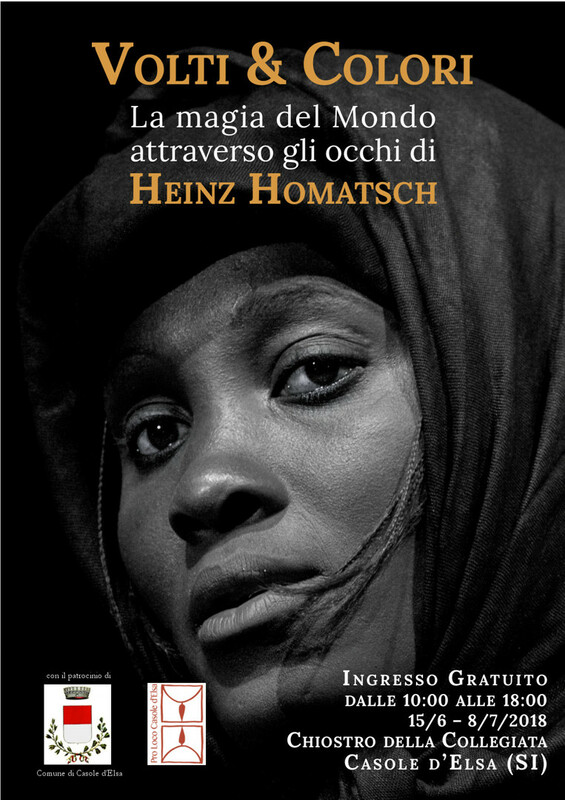 Il fotografo Heinz Homatsch, nato a Vienna ma trapiantato in Toscana da molti anni, ha selezionato immagini dai suoi viaggi in oltre cento paesi. “ Viaggiare, conoscere e comunicare è parte importante della mia vita e la fotografia aiuta e spinge di farlo” spiega il fotografo. “Il mondo è un libro e chi non viaggia, ha letto soltanto la prima pagina. Ho visitato più di cento paesi e ogni persona incontrata e tutti i luoghi visitati hanno lasciato dei ricordi unici”. La mostra è dedicata a volti, Ladakh, i monaci di Myanmar e la via della seta dal 1975 ad oggi e può essere visitato nel chiostro della Collegiata a Casole d’Elsa dal 15/6 all’ 8/7. A photographic exhibition, which shows a selection of portraits and landscapes from the world. The photographer Heinz Homatsch, born in Vienna but transplanted in Tuscany for many years, has selected images from his travels in over a hundred countries. "Traveling, knowing and communicating is an important part of my life and photography helps and encourages us to do it", explains the photographer. "The world is a book and those who do not travel have read only the first page. I have visited more than a hundred countries and every person I met and all the places I visited have left unique memories ". The exhibition is dedicated to portraits, Ladakh, the monks of Myanmar and the Silk Road from 1975 to today and can be visited in the Cloister of the Collegiata in Casole d'Elsa from 15/6 to 8/7. Eine Fotoausstellung, die eine Auswahl von Porträts und Landschaften aus aller Welt zeigt. Der Fotograf Heinz Homatsch, geboren in Wien, aber seit vielen Jahren in der Toskana, hat Bilder von seinen Reisen in über hundert Ländern ausgewählt. "Reisen, Wissen und Kommunikation ist ein wichtiger Teil meines Lebens und Fotografie hilft und ermutigt uns dazu", erklärt der Fotograf. "Die Welt ist ein Buch und diejenigen, die nicht reisen, haben nur die erste Seite gelesen. Ich habe mehr als hundert Länder besucht und jede Person, die ich getroffen habe und alle Orte, die ich besucht habe, haben einzigartige Erinnerungen hinterlassen. " Die Ausstellung ist den Menschen, Ladakh, den Mönchen Myanmars und der Seidenstraße von 1975 bis heute gewidmet und kann im Kreuzgang der Collegiata a Casole d’Elsa besucht werden.